Daktacort is a topical treatment that can be used to treat inflammatory skin conditions, including dermatitis, eczema, and intertrigo (rashes that occur between skin folds). Can I buy Daktacort online? 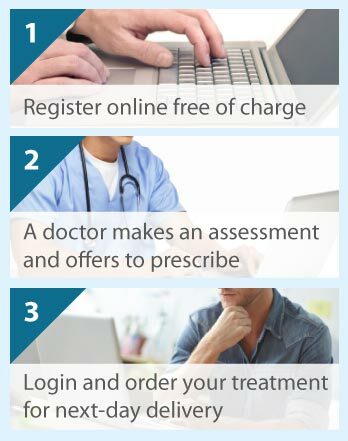 The Online Clinic doctors can prescribe Daktacort online for next day delivery. Simply complete a quick online consultation and the medicine will be dispatched and with you the next morning. Daktacort preparations contain two active components, miconazole nitrate (2% w/w) and hydrocortisone (1% w/w). Miconazole nitrate is an imidazole- and triazole-derivative that has both antifungal and antibiotic properties, killing the fungus and bacteria that cause infection. Hydrocortisone is a mild anti-inflammatory topical steroid that reduces the inflammation, redness, swelling, and itching of the skin that occurs in inflammatory skin conditions. Medicines should be used as your doctor has told you. Daktacort is supplied as a cream or an ointment that is applied to the surface of your skin. Usually, a small quantity of cream or ointment are applied to the affected skin area 2–3 times per day. If there is no improvement after 7 days' treatment, then talk to your doctor. Children and the elderly should not use this medicine daily for longer than a few weeks. Daktacort should not be applied to large skin areas or under nappies in children, and can exacerbate the natural skin thinning that occurs in older people. To apply Daktacort, firstly remove the cap of the tube and use it to break the seal. Wash and dry the area of skin to be treated, using towels and flannels that are for your use only to prevent spread of infection. A small amount of medicine is then gently rubbed into the infected area until it is gone. Thoroughly wash your hands afterwards (unless they were the areas needing treatment) to prevent spread of infection to different areas of your body and to other individuals. Washing and frequent changing of clothes covering the infected areas is important. Choose cotton garments such as underwear to prevent potential damage to synthetics by Daktacort. Anyone swallowing Daktacort should see a doctor immediately. If the preparation accidently gets into your eyes, rinse your eyes immediately with water, keeping them open. Do not apply any missed dose; use the medicine as instructed at your next scheduled time of application, and do not apply two doses because you missed one. People of all ages can use Daktacort. As with all medicines, pregnant or breast-feeding women, and women who think they are pregnant or planning to conceive should take advice before using Daktacort. You cannot use Daktacort if you are hypersensitive to miconazole nitrate, hydrocortisone, Daktacort's other ingredients, or other imidazole- and triazole-derived antifungal products. Neither should you use Daktacort on skin infected with herpes virus (cold sores, chicken pox or shingles). Daktacort is not generally for use on your face unless your doctor has said you can. It is important to note that you or your partner may be at risk of pregnancy if you use ‘barrier’ methods of contraception made of latex (e.g., condoms or diaphragms), because their effectiveness is reduced. Seek advice about alternative contraception. All your current, recent, and potential medicines, both prescription and non-prescription, must be discussed with your doctor. Specifically mention anticoagulants (blood thinners) such as warfarin. If you experience signs of allergy, stop using Daktacort and contact your doctor immediately. Such signs include facial and throat swelling, problems swallowing or breathing, and a raised itchy red rash at the application site. A few people report skin itching and burning sensation, and general irritability. Other effects noted have been skin sensitivity at the treatment area, pale skin patches, and contact dermatitis.